Are You Eligible to Claim the Foreign Tax Credit? Do you qualify for the foreign tax credit? Some people live on more than one patch of soil, residing in different countries at different points during the year. If you're one of them, you know this complicates your tax situation, but here's a bit of good news. You might be eligible for the foreign tax credit. When an American pays income tax to a foreign government, that tax can be claimed as a credit against his U.S. federal income tax. The purpose of the foreign tax credit is to reduce the impact of having the same income taxed by both the United States and by the foreign country where the income was earned. Is the tax imposed on you? Did you pay or accrue the tax? Is the tax a legal and actual foreign tax liability? Is the tax an income tax or a tax in lieu of an income tax? If you can answer yes to all of these four questions, those taxes can be included in your calculation of the foreign tax credit. Otherwise, you don't qualify. Here's an example. Jorge and Roberta own a house in Germany and they pay property tax each year. Even though the tax is a tax imposed on Jorge and Roberta and they actually pay it, and even though the amount paid is the legal and actual amount of their tax liability, this tax is not an income tax. Therefore, their property tax payments are not eligible for the foreign tax credit. It used to be that Jorge and Roberta could deduct this as an itemized deduction for real estate taxes instead, but that tax provision has been eliminated by the Tax Cuts and Jobs Act that went into effect in 2018. Speak with a tax professional if you find yourself in this position because you can still claim this deduction on your 2017 tax return. You can claim the foreign tax credit if you qualify by completing and filing IRS Form 1116. This form calculates the various limitations placed on the amount of the tax credit you're eligible for. 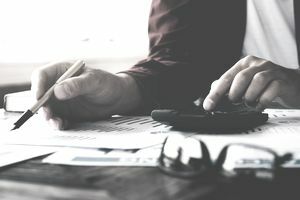 As the IRS explains in Tax Topic 856, "If you use Form 1116 to figure the credit, your foreign tax credit will be the smaller of the amount of foreign tax paid or accrued or the amount of United States tax attributable to your foreign source income." All your foreign source gross income was from interest and dividends. All that income and the foreign tax paid on it were reported to you on Form 1099-INT, Form 1099-DIV, or Schedule K-1. The total of your foreign taxes is equal to or less than $300, or $600 if married filing jointly. You held the stock or bonds on which the dividends or interest were paid for at least 16 days and were not obligated to pay these amounts to someone else. You are not filing Form 4563 or excluding income from sources within Puerto Rico. All of your foreign taxes were legally owned and were not eligible for a refund or a reduced tax rate under a tax treaty, and they were paid to countries recognized by the United States and do not support terrorism. You may not take either a credit or a deduction for taxes paid or accrued on the income you exclude under the foreign earned income exclusion or the foreign housing exclusion. But if only part of their wages or self-employed income is excluded, the individual can claim a foreign tax credit on the income that was not excluded from tax.